Mallory Part Number: 150224J630LE. handling ability. ~ Lot of 10 Pieces ~. These are Quality Capacitors…. These are non-inductively wound with super high insulation. 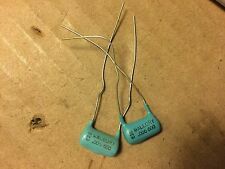 Mallory Ajax Blue Molded Capacitor.1 mfd and 200 volts with very nice leads. Tested on a high quality Peak Atlas LCR40 capacitance tester. The Blue Molded is vital to an authentic period restoration or build. Hi There, Up for sale today I have a NOS Vintage Mallory Molded Tubular Capacitor. 033 MFD 600 VDC GEM-6133 in Good condition. As always, please feel free to message me with any questions prior to buying and thank you for looking! Also, we do combine shipping, so by all means please feel free to take a look at some of our other items in our store before checking out...we have upwards of 1000 collectibles in our current inventory, so chances are might have something else that you are looking for! Bid/Buy with confidence...I am an experienced seller with A feedback, tons of return customers, professional packing and very quick shipping! Thanks Again! 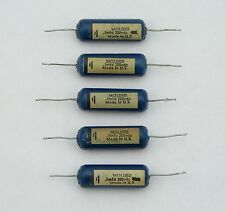 Four (4) Leslie Mallory Type FP USA Can Capacitors. One NOS Mallory 30 uF 450 Vdc Audio Filter Electrolytic Twist Lock Capacitor. Surface tarnish. 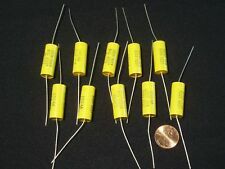 5 x NOS .1 uF 400 vdc Mallory Mylar Capacitors - 1970s! This value adds a bit more midrange to the tone stack. I got a good deal on these and will pass that on to you. The used ones all worked when pulled. These are untested and sold as-is. Mallory 150. Make: Mallory. Value.001 uf. I tested a few and those were NOS and tested within 50%. MALLORY FP452.5 SECTION CAN CAPACITOR WITH PHENOLIC MOUNTING PLATE. They have never been used, but it's been 40 to 50 years since they were manufactured. SIZE IS F ON CHART 1-3/8" DIA 2"L.
Values: 750/750/350 uF 16V 4 uF 11.5 RMS. Type: Electrolytic capacitor WP-401.8. <5.0mA or less is considered "good". 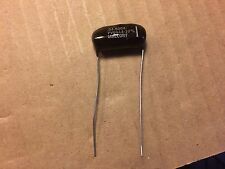 Type: TCS 64 electrolytic capacitor. Values: 15 15 uF 350VDC each. Tested At 350VDC. NOS Mallory Three-Section Twist Lock Audio Filter Electrolytic Capacitor, in excellent condition. .1 mfd 600V. Mallory GEM-601 NOS Capacitors. In my opinion, and the opinion of many tester experts, this is the best tester that was made by Hickok. A real gem. Bulk lot tubes will not be individually boxed. 1 Mallory TC-80 Electrolytic Capacitor. For sale are 2 new old stock Mallory capacitors. 1- FP412.143 capacitor with box missing part of one flap... see pictures 1-FP302.5A capacitor with box and mounting plate. I believe they are from the 1940s. These are marked. 01uf 1600v but may have drifted over the years. They appear to be NOS unused but I do not know that for certain. Up for sale is a vintage 1940’s Mallory Bumblebee Foil Capacitor. While it has a bit of wear, it is in great working condition, especially for its age. Sold as is, no international buyers or forwarding agencies. If you have any additional questions regarding this listing, feel free to ask. Thank you! HS-693, 8MFD or 8uF, 600 VDC. 1 NOS, no box, Mallory Electrolytic Can Capacitor. Picture 5 shows both capacitors, but sale is for 1 capacitor only. 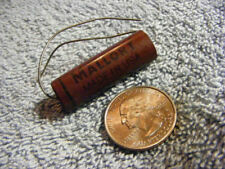 Up for sale here is this used Mallory can capacitor. This is untested and is sold as non-working due to age. The sections have probably drifted at least 10-25% upwards of the labeled numbers. Each capacitor is marked. 01 uf 6000v and tests around. 014 uf, with a bit of leakage. Up for sale here is this set of 4 Mallory can capacitors. I think these are used, but I don't know for sure. The sections have probably drifted 10-25% upwards of the labeled numbers. These have mixed 1970s dates, and are in good shape with light overall wear and possibly a few small dents/scratches. High quality Mallory "Computer Grade" capacitors. Price is per capacitor. 30-100-5-200 MFD at 350-350-350-25 VDC. Has been used; there's solder on the terminals. Found in a box with a bunch of random capacitors in my Dad's shop. If it doesn't work I offer refunds. MALLORY FP454.2 4SECTION CAN CAPACITOR WITH PHENOLIC MOUNTING PLATE. They have never been used, but it's been 40 to 50 years since they were manufactured. SIZE IS H ON CHART 1-3/8" DIA 3"L.
40-20-20-10 MFD at 350-350-350-350 VDC. 5 QTY GEM-1624 . 004 MFD @ 1600VDC. 2 QTY GEM-1625 . 005 MFD @ 1600VDC. 4 QTY GEM-1622 . 002 MFD @ 1600VDC. 2 QTY GEM-1623 . 003 MFD @ 1600VDC. 1 QTY GEM-1615 . 15 MFD @ 600VDC. 1 QTY GEM-10035 . 0005 MFD @ 10000VDC. Being offered is a pair of capacitors are shown in the photos I described in the title. Please note that we do not ship internationally. For sale a Mallory filter capacitor- 10000mf 100 Volts. Good used condition. 4 unused Mallory 450 volt capacitors. Our prices are not set in stone. We will resolve the situation more quickly. We strive for a smile when you receive your item. Each capacitor is marked. 02 uf 6000v and tests around. 026-.027 uf, with a small amount of leakage. These are pretty large. 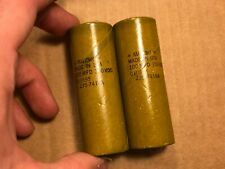 Lot of four 700 mfd 400VDC Capacitors. Great for a tube audio amplifier. One NOS Mallory 4100 uF 250 Vdc (300 Vdc surge) Electrolytic Filter Capacitor, made in the USA. One is NOS and 3 are used. They are marked. 10 uf 600v, but may have drifted over the years. One Mallory 160,000 uF 10 Vdc Electrolytic Filter Capacitor, made in Canada. Part/Model Number: Type FP. We have a vast inventory of thousands and thousands of tubes. They are marked. 01 uf 600v, and will test good. They are marked. 0068 uf 1600v, and are untested but will probably test close to that.